I meet both Kelly and Jon at the 2000 St. Judes Benefit in NYC. I had went and seen Jon once before in the early 80's when he was first starting out on the show at my local mall in Columbus, Ohio. I remember thinking how much I would love to meet Jon again when I noticed him on the other side of the room. I was really excited and went directly over to meet him. He was dressed in a suit looking so suave drinking some wine and chatting with Kelly and others. When I first approached Jon he was so shy and I shook his hand and told him I had seen him before and he said, I am sorry, I don't remember. I said, well, that was so long ago. He was very sweet and I told him how much I loved Holden and that I had been watching the show for many years. I also told him he was wonderful and he smiled and said thank you. Then I asked if I could have my picture taken with him and he said yes and it was a really great pic too. I said thanks and left because there were many happy fans waiting their turn. Next I turned to Kelly who standing there near Jon greeting her own fans. She is so much more beautiful in person. I waited my turn and told her how happy I was to meet her and how much I loved her Jon as a couple. She was very gracious and thanked me for being so nice. I also told her I loved her on the show and I had watched for many years. Then I asked for a pic and she said yes, so we got a very nice pic together. She was also wearing this false hairpiece which looked so cool on her. Kelly and Jon shined that night. They are a very nice, handsome, wonderful couple and I am so happy I got to meet them. I was quite nervous about meeting Jon Hensley for the first time. I was basically shaking in my boots. 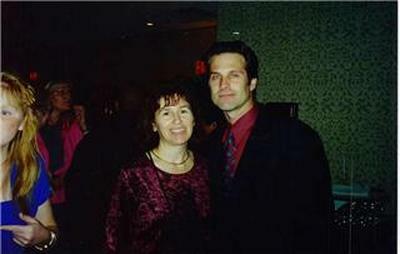 I was forunate to meet Jon at the 2002 ATWT Fan club Luncheon.Behind his basically tough exterior was actually a shy and yet a likeable guy.After agreeing to sign my photograph I told him that I was hoping he'd take home an Emmy Award for his performance in the Malta storyarc. He replied that while the story was fairly good but he modestly told me that it really wasn't enough for Emmy consideration.This year Kelley and Sophie joined Jon this year at the fan luncheon(2003). It was a treat meeting her.She appreciated the gift of fan letters from Hensley_World.I needed to remind her what Hensley_World was and she was happy to hear that she was appreciated by so many of us.Both of them were so easy going that I could have talked with them adinfinitum but I'm not one to upset the other fans. Meeting Jon Honsley was at the top of my list for my first Fan Club Luncheon this year. His portrayal of Holden Snyder was one of the things that got me interested, then hooked on As The World Turns way back in 1987. Though I was a bit star struck when meeting him and Kelley all I could really say was good job. They both are very sweet and generous people. While I was at their table their kids came out needing some Mom and Dad time. And they found a way to ease the kids while meeting the fans. I hope to get another chance to meet them either at the benefit for St. Jude's this year, or another Fan Club Luncheon. I meet Kelley and Jon at the 2003 fan club luncheon. I didn't really talk to them for long, because I didn't know what to say!! They were such a sweet couple and eagerly signed some pictures and a tote bag for me. I'd love to meet them again sometime! !